GROM Firmware Here you can download the latest version of firmware for your GROM-MST4 interface. 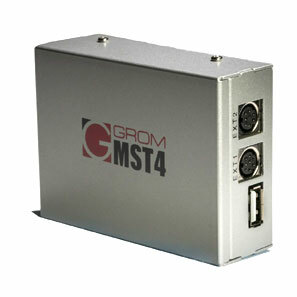 Here you can download the latest version of firmware for your GROM-MST4 interface. Check out the picture on the left for the visual reference. The firmware update is done. Ready to use! Make sure you remove grommost.hex from the stick to avoid unwanted firmware change later ! Make sure you are renaming file correctly to grommost.hex and not grommost.hex.hex Check this out as this is mistakenly done all the time. Try Using smaller Size USB stick 8GB and below. Make sure the USB stick you are using is formatted FAT file system structure i.e. FAT32, FAT16 or FAT. /// NTFS and exFAT is not supported by the GROM. Try using a different USB stick if one you are currently using is not working. If you still cannot get it to work try to use the same USB flash drive you use to play music to flash the firmware.